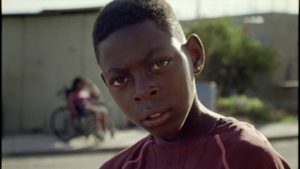 Tiquan, the thirteen-year-old narrator of cinematographer Shabier Kirchner’s directorial debut, Dadli, has places to hide, the way teenagers need to. “I go far in the country,” he says. “Hunt, get high — nobody troubles me.” Dadli, a brief and searing documentary portrait of Antigua, where Kirchner grew up, is as short as Tiquan is young, but it provides plenty of time to meet him. Kirchner evinces, slowly, the involuntary pauses taken, like breaths, in the perfunctory haze of the day — the way you might remember, long after the fact, the brief incredulity in a friend’s eyes during a conversation, or the song on the radio that hour.